"In 2013 we turned over all of our software development to Up and Running. Their teams and project managers are the best we have ever worked with. Development gets done on time and exceeds our expectations. Communication is easy and they continue to come up with elegant solutions to our problems. I highly recommend Pete and Up and Running." "Pete has provided us with strong technical expertise and leadership in numerous projects. It has been very easy and satisifying to work with him and his team as they always managed to provide us with on-time solutions, both from a technical and resources standpoint." - Francois Groleau, Senior Software Engineer at Yahoo! "Peter and Up and Running are fantastic to work with. They took our system for entering field-based meetings to levels beyond anything that we could have imagined. Any problems/upgrades that we come to him with are greeted with a better solution than we ever could have thought it would be. They rock!" "We had a unique challenge on a web project that required a different level of creativity. Our internal resources were already stretched thin and our external e-commerce software developers were unable to provide a solution. This was an integral part of a new wireframe rollout that was on deadline. Our challenge - we needed to find a skillset that could combine a customization to an unique ecommerce environment, a responsive UI widget that displayed product discounts based on user behavior, and connect to a third party API managing users without an issue. Not a huge project, but definitely one we needed a partner who we could trust, could see all the pieces quickly, communicate clearly and concisely and bring a solution to the table in short order. When Up & Running was recommended we quickly found Pete and team to be clear communicators who could both speak to our marketing team and our IT team. They delivered on time, on budget and built a bond with our IT department. We have since given them additional overflow projects including improving our site speed for SEO and UL." A note from us regarding Isaac’s kind words: We have over 10 certified Magento developers on staff, and we approach e-commerce work as we do any system, seriously and according to best practices. It’s easy to say that you know a framework, but it’s a lot harder to know the programming behind it, in this case Zend (we’re also certified in) and PHP (been using since 2001). In Magento’s case, we’ve been using it before it was called Magento, when Varien first stopped developing for osCommerce (we also used to use this) and created their new e-commerce system. Likewise, for most mainstream OSS frameworks, front-end and back-end, we have similar experience and depth. We don’t just put a sign on our door saying we know a framework; rather, we’ve likely been working with it since its inception or very close to it and we know the languages it was created with at a professional software developer’s level. This whole approach to software development is why things went so well with Mono Machines, that is, we know Magento and most OSS frameworks at levels of depth that is hard to find simply because it takes a decade+ of focus to earn that level of experience. Defined and created unit and functional tests around a key client-side interface that funnels all requests and responses from the recommendation engine to each client's site. They also refactored the code base, utilizing a dependency-injection approach to handle specific customer exceptions. Created a tool set for use on third-party websites to determine and test if a particular client-side library was implemented and running optimally. This flexible tool saved us a lot of time, and ensured consistency and quality in the software's application across a large volume of sites. Pete and his team are a valuable addition to any organization that needs regular help or just some scale once in a while." "I have had the pleasure of working with Up and Running, a custom software development partner of Alliance Data, for many years and can vouch that their technical prowess and work ethic will exceed your expectations. Up and Running is an exceptionally reliable and consistent resource. In fact, they are the most competent and dependable software vendor I’ve worked with in my entire career. From custom PHP in support of complex Drupal systems, to responsive designs, to Apache configuration, to helping our internal and external customers with whatever they might need, Up and Running was a quick call, skype, and email away. They have been a valuable and adaptable addition to our team, easily adjusting to the demands of each and every project and delivering great results while communicating professionally. We and our clients are demanding too; we are a multi-billion dollar company and most of our customers are multi-billion dollar customers, a point I want to make to ensure I’m conveying well enough the caliber of people I’ve interacted with. I look forward to working with Up and Running for many years to come and I highly recommend their talented team! They know technology and, most importantly, they care about the projects personally and they’re just really enjoyable and easy to work with." "Pete and his team at Up and Running have been a tremendous help on numerous projects over the years with building complicated dynamically-driven websites from scratch and understanding the pros and cons of different approaches to tackle the objectives of a project. They have on more than one occasion bested our own internal IT department in terms of knowledge, thoroughness, and ingenuity, significantly delivering key projects on time and on budget. Up and Running should absolutely be in your consideration set for website development, Drupal CMS, and custom application development." - Geoff Smith, Chief Marketing Officer at CrowdTwist, Inc.
"Horizon Research, Inc. uses many highly-customized online data collection and management tools. Until 2008, we developed our tools exclusively in-house, but by then our needs had outgrown our in-house capacity - both in project size and programming skill requirements. After an unfortunate learning experience with an unreliable and unethical consultant, and a vigorous search for someone to work with that would be dependable, responsive, and flexible, we decided to go with Up and Running. We could not be happier! Estimates (both time and cost) are accurate, communication is clear and quick, and the product is exactly what we want and need. We signed on with UAR for one, particular, large project, but are looking forward to a long-term relationship." - Alison Bowes, Senior Research Associate at Horizon Research, Inc.
"Pete and his team are great both in a 'crisis' as well as strategic planning for long-term projects. I have worked with Pete and his team in both modes and have been pleased with the results. Pete is a great listener and provides guidance on technical recommendations with easy to understand explanations of what the technical choices are and why one may be a better solution than another. I have enjoyed working with Pete and look forward to doing more projects with him and his team." "The quality of work, communication and attention to detail provided to our company by the team at Up and Running was priceless. Their attention to detail and genuine interest in seeing us succeed were critical factors in helping us to create and foster a caring, dedicated business relationship that promises to yield more opportunities for collaboration in the future." "Peter of Up and Running provided my company Voices.com with reliable and consistent service for a number of years, enabling us to rewrite our site from the ground up. Working with Up and Running was key to our growth and assured us the comfort of having web developers at the ready during a time when we didn't have our own developers on staff and required outside support. I recommend both Peter personally and his company Up and Running." "Personalized service is one of Up and Running’s many assets. I’m pleased to have a full team of contacts at Up and Running, who are accessible whenever I need assistance. They are my software development team, and I communicate with them just as if they were full-time employees who I’ve worked with for years. I have their emails, cell phones, IMs, and I am confident they will be available when I need them. Up and Running has also helped us shape our business strategy and processes. We feel comfortable discussing vision, mission, strategy, and tactics at the business level and the business operational level. In a sense, I consider them my CIO in addition to my development team." "Up and Running provides Amazing Service. I've worked with many computer companies for decades... and the Experts at Up and Running are truly Smart, Professional and Extremely Fast...I'm ALWAYS impressed by their timely and accurate assessments... that prove out in execution. I recommend them highly. Look no Further... if you want to get "Up and Running" quickly, efficiently and effectively... Enlist their Service!!!" "We can't help but think that the name of their company is so appropriate, because Up and Running is a very satisfying place to be, and as you can see, we are satisfied customers. We must also mention that our working relationship could not have been more pleasant. Now it's time for us to confidently pass on the recommendation to you." "The versatile Up and Running Event Management Software (EMS) package is an outstanding platform that we customized to meet our particular needs. Our event was scheduled with short critical timelines to develop and deploy an effective package for the U.S. Army. The initial software parameters were difficult to define and were changed as the event developed. Up and Running quickly adapted to this environment by providing the best customer support I have ever experienced." "Up and Running has taken the time to understand the needs of Dial Help and is conscientious of our financial limitations. Up and Running has been willing to work within the parameters of our financial status and still provide the absolute best service and products possible. They are in the process of developing and implementing two new complex databases, and have included appropriate staff members to ensure the software is user friendly and fits our specific needs." "We cannot say enough exemplary things about Up and Running and would not hesitate in recommending them to anyone. They have shown nothing but professionalism, courtesy, and respect to us since we have started working with them." - Terry Sayatovich, BA, Victim Services Coordinator/Interim Director at Dial Help, Inc.
"The Keweenaw Community Foundation thanks you for your wonderful volunteer work with our group. Since June, you have worked very graciously to help us get our new donated computers 'up and running'. The professional behavior and attitude of your team cannot be underestimated; Matt and his staff have always alerted us to changes in their schedules when they had other business that interfered with what they were doing in our office. We appreciated that their concern with our office was very important to the group. Obviously, this reflects the values of an organization that values people along with systems excellence." "We have been working with Up and Running for almost two years. During that time they have shown to be extremely competent professionally, and, just as important, very customer focused." "Those guys at Up and Running really helped me out when I needed it by designing and implementing an online application used to organize all of the Little Caesars amateur hockey teams. It was a rush job, and I appreciate that they were willing to work nonstop, late nights and weekends, to get it done so quickly. This was no small task either; I have over 800 users using the thing, and they wrote it to my specifications and needs. They even went beyond that and built many helpful features into the application that I never would have thought of, something very considerate given the deadline I imposed on them. Whenever I need help with it now, they are always quick to lend a hand, courteous and professional as always. For all of these reasons, I am taking all my future work to these guys, and am even right now talking to them about the design specs for the next project." "We've had the Up and Running team helping us for many years. Every UAR interaction we've had is positive, and the staff is composed of true professionals--conscientious, capable, reliable, and very easy to work with. I highly recommend Pete and his entire team." "We've worked with Pete and one of his developers for the past year and a half and have been quite happy with the results. Pete has that real enthusiasm for technology that another techie instantly recognizes. He communicates well, knows his stuff and delivers quality results on time. I am happy to recommend Pete and his company." "To call Peter a master of his trade would be a disservice to him. Not only is he more than an expert in his field, but his skills are so numerous that he falls outside the norm of excellent practitioners I have worked with for almost two decades. Peter exhibits, demonstrates and delivers a technical sophistication that is a work of a master craftsman par excellence. As soon as I met Peter, I knew he was who I wanted to work with. Immediately, his ability to clearly communicate his thoughts and articulate his analysis of a complex problem was apparent. Having worked with him for a few months now, I can say that I made the right move: On occasions too numerous to count, Peter has demonstrated his ability to think outside the box to solve complex issues and to deliver results that have made a difference. He can work alone or as part of a team and in every scenario, he delivers. Peter’s knowledge of web application development and specifically the ability to iteratively grow a product by first starting with the MVP—minimum viable product--and then continuously refining feature-by-feature was key for my startup to not only get traction but save costs. Iterative, Agile processes allowed us to see an early version of the concept, keeping us from pouring money into a full-blown estimate-driven project. In this way, in addition to my own gut about Peter, I was able to see how things were moving forward for the first couple of weeks to further reassure myself that he and his team were what I was looking for. Aside from his technical profundity, Peter is a fantastic person. Delivering top quality (customer) service, working side-by-side through stressful situations and being a kind, polite and affable person are his hallmarks and I’m thrilled to know him and to have the pleasure of working with him. I would unquestioningly recommend Peter—and have on multiple occasions!" - Aurangzeb "Zabe" Agha, Founder at Metrical, Inc.
"Pete is the guy every CEO/manager should have before embarking on any IT project. Pete is excellent for the entire life-cycle of software development. He is also a very ethical guy who delivers above and beyond. Pete stays on top of every project and manages it succesfully to the very end. Customer satisfaction is his highest priority. His ability to 'roll-up-his-sleeves' and jump in is a great asset to have too. Pete has also become a dear friend over the years. I highly recommend Pete and his firm." "What impressed me most about Up and Running's approach to our project was their vision and leadership, commitment to the customer, insistence on setting realistic goals with succinct timelines, organization and project management, education and coaching." "Pete is an outstanding manager with excellent technical and customer skills. A great communicator, Pete delivers projects on-time while closely working with clients to deliver results that surpass expectations." "Pete and the Up and Running team have been a pleasure to work with. 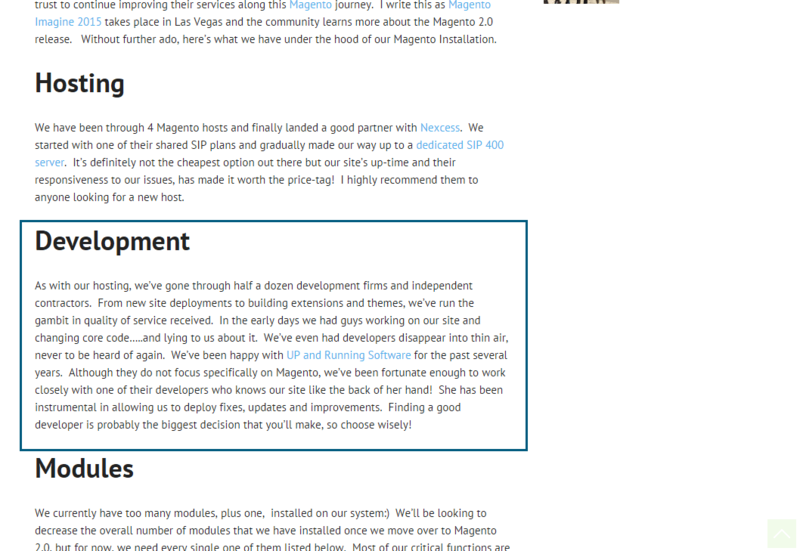 I have worked with his team on a few different Magento implementations the past several years. They have a deep understanding of Magento which allows them provide outstanding solutions. They are head and shoulders above the rest." "I’ve had the pleasure of working with Pete and his team at Up and Running for about two years. They have proven to be a stable, reliable, and responsive development partner. Pete has an unmatched commitment to his customers, and the Up and Running engineers have shown a dedication above and beyond what I’ve experienced from any other development partner. They are an integral part of Passare’s software development team and together we’ve brought a fully differentiated product to market in 18 months. I recommend Up and Running to any organization looking for a professional, dedicated partner to bolster their development efforts, and personally look forward to many more future projects with them."